In a previous article, I discussed that when your dividend stock cuts or eliminates its dividend, it would be a good decision to admit that you were wrong on this decision and sell immediately. I understand that selling and admitting that one is wrong is a very difficult decision from a psychological standpoint. But it is essential to cut your losses on some investments that you would not otherwise consider buying in order to protect your capital and stay in the game. Admitting that you are wrong and taking a decisive action, instead of hoping that the things would turn out for the better works both ways. When companies cut their dividends, I sell their stock immediately.My recent experience with ACAS is an example of that. However when a company that has cut or eliminated their dividends announces that it would start increasing its dividends again or its initiating a dividend payment I would definitely consider initiating a position. Dollar cost averaging my way into this position could be an ideal way to get a feel of how your investment might perform. Another entry signal that one could look for is for the company to increase its dividends for at least ten years, before buying back their shares in the stock. Most investors who are close to or in retirement look for dividend stocks as a source of their retirement income. I believe that this is a great investment strategy, as long as these investors don’t chase high-yielding stocks. With the average market yields at 3%, stocks that yield more than 10% should not be automatically embraced in ones income portfolio, but examined more closely than usual. There are several reasons why a stock is yielding over 10%, one of them could be that the stock price has been in a severe down trend, which has increased the current yield on the stock. Every dividend investor should be focusing not only on dividend income, but also evaluating the safety of their principal. If the high-yielding stock is paying a 10% current yield, but most of it is a return of capital, then chances are that the dividend payment will not be maintained in the future as the company’s capital base shrinks. Furthermore if a stock used to yield 3% but due to a decrease in its stock price is yielding 12%, the market might be sending a message that the current dividend payment is in danger of a cut. Financial companies like Bank of America (BAC) and Citigroup (C) in 2008 are a prime example of this scenario, as their current yields rose to 8%-10% because their stocks fell sharply in response to the softening of the general economy. Investors who purchased these stocks were hit on two fronts – the share prices dipped lower and the dividends were cut, which decreased yields on cost significantly. In other words if you are chasing a 30% dividend yield, then make sure that you don’t lose a lot in capital gains in the process. My experience with American Capital Strategies (ACAS) was a very good example of chasing a high-yield stock and getting burned in the process. Before you invest your hard earned money in a dividend stock, always try to gauge how safe the dividend is, by looking at the dividend payout ratio and the dividend in relation to the cash flows per share. A high dividend payout ratio would tell you in most situations that the probability of any further dividend increases is greatly diminished. 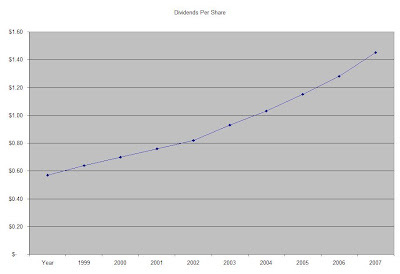 For most of the dividend aristocrats a dividend payout ratio of 50% or below indicates a healthy relation between the distributions and earnings, which also provides the dividend investor with a margin of safety. Lower dividend payout ratios also provide for more room to support for future dividend increases. There are however certain stocks which pay out more than 50% of their payout ratios to shareholders such as utilities, Canadian royalty trusts, Master limited Partnerships, oil tanker stocks as well as real estate investment trusts. Many investors, focusing on current income are buying onto these stocks in order to generate higher yields on their investments. The reason why these investments produce above average yields in most circumstances is because they also return capital as part of their distribution to stockholders. This is similar to you selling off a portion of your dividend holdings each year, and claiming the proceeds from this exercise a distribution to you. As dividend investors your primary goal is to generate income from earnings, which could be increased over time in order to beat the eroding power of inflation. Investors shouldn’t focus exclusively on pass through entities such as Canadian Royalty trusts like PGH, PWE, HTE and MLP’s such as KMP and TPP as their investments could easily lose money if there are changes in the tax codes, which could negatively affect their portfolios. For example prior to 2006 many retired Canadians owned income trusts, which were taxed very favorably and paid out very handsome yields. In 2006 however the Canadian government announced that it was changing this corporate structure in 2011, sending trusts shares along with their distributions much lower. Now I do believe that creating a diversified portfolio of income producing investments could include oil tankers, Canadian royalty trusts, master limited partnerships and real estate investment trusts. The goal of your retirement portfolio should be to not to overweight these investments with high current yield, but unstable dividend payments. In 2008 overweighting of shipping stocks such as DSX or FRO would have lead to decreases in dividend income as these stocks either cut severely or suspended their payments to shareholders. 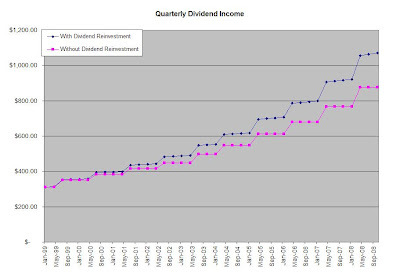 I also believe that dividend investors should be tracking their yield on cost more closely than current yield. Yield on cost tracks the dividend yield on your original investment. If you bought a stock like JNJ, PG, MO one or two decades ago, you would be making a pretty decent yield on cost nowadays, which is close to what certain high yielding investments generate today. This article appeared on The Div-Net one week ago. While I realize that these are some valid concerns, I disagree with them for several reasons. First, if a company that has increased or maintained its dividend cuts or suspends its dividend, it shows that it doesn’t have a firm grasp of the current situation due to it being a cyclical company or because its business model is broken. Dividends are typically a sacred cow in US, and companies like to please shareholders with stable or increasing payments over time. The best dividend friendly companies out there make their business decisions with their shareholders in mind. They are careful with the capital allocation process so that their new ventures do not collapse causing the company to lose money and forego a dividend payment. Once management cuts or suspends its dividends, there is nothing that could stop them from cutting the dividend again or suspending the payments indefinitely. Furthermore, a company that shows fiscal irresponsibility to be unable to maintain its dividend payment is in great danger to even declare creditors protection. The biggest surprise is the removal of Nucor (NUE) from this elite list despite the fact that the company recently increased its payment to shareholders by over 9% to $0.35/share. Nucor does pay a special dividend in addition to the regular payment however. The special dividend payment has been decreasing over the past few years, as the regular payment has been increasing. The total quarterly payment for 3Q 2008 of 0.52/share was lower that 3Q 2007 payment of 0.61/share, which could be the reason why Nucor is booted out of the dividend aristocrats index. Check out my analysis of Nucor (NUE) from this link. Wrigley and Anheuser-Busch were removed because they were acquired. The rest of the deletions include financial companies, which cut their payments to shareholders in 2008. In 2008 the dividend aristocrats’ index outperformed the S&P 500 by 15.50 percent. The dividend aristocrates lost 21.55% in 2008 versus the 37.00% loss for the S&P 500.